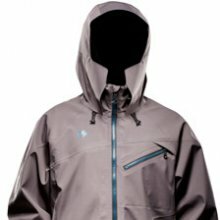 The Homeschool Anvil Jacket is Homeschools’ flagship jacket and it’s rather unique to the industry in design and materials. 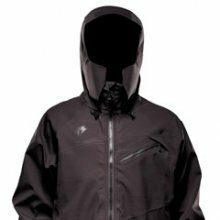 Usually there is less breath-ability and more waterproofing but the Homeschool Anvil Jacket is the opposite. This jacket has 3.5 layers as well as exceptional breath-ability. 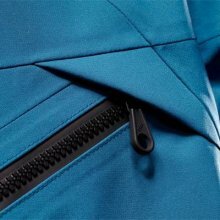 Homeschool makes snowboard specific technical outerwear that should be strongly considered. 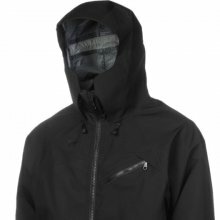 The Homeschool Anvil jacket is all about serous weather protection. 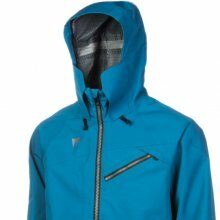 It’s not a Gore-Tex jacket which might turn some off but if you can get past that you could end up with one of the best all conditions technical shells out there. Let’s start with the appearance. 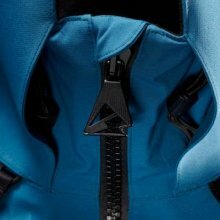 The Blue Jacket is more of a turquoise blue than what it looks like in the pictures and the color is person to us has a better look than what you see in the pics. It’s also very stiff. It’s a far departure from the ultra thin 4 way stretch materials that you see in some of the newer technical shells out there these days. The thick 3.5 layer jacket feels very solid and very hard to tear which to us outweighs the feel like it’s 3.5 layers of heavily starched jacket. It also has a smell that resembles a relatively new paint mixed with coconut to it that actually smells pretty good to us. The fit is also a little on the baggy side of normal which you will like if you layer up a lot or are a thicker guy like me the editor. These days the jackets are getting more and more in line with Holden and that can be tough for guys that aren’t manorexic. 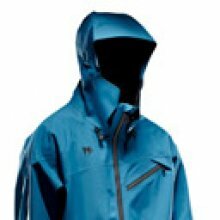 So the 3.5 layer (.5 pas most high end shells) thick jacket acts as an exceptional barrier from the elements. The thickness of the shell makes it just a little past poor for warmth even though it’s still a shell without lining. It’s still a shell that most will need layering. There is also a layering system that Homeschool Snowboarding offers. 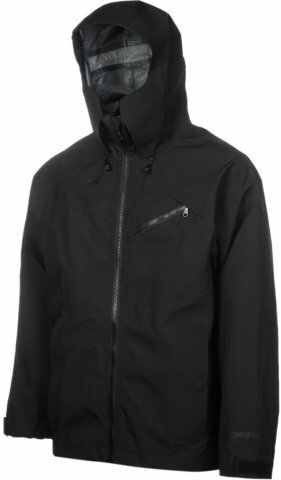 They offer a 1st layer called the airbreather crew, a second layer zip moc turtle neck called the Art Hag and a 3rd layer thin and light puffy called the Zodiac Insulator. This system can provide a pretty solid warmth system. 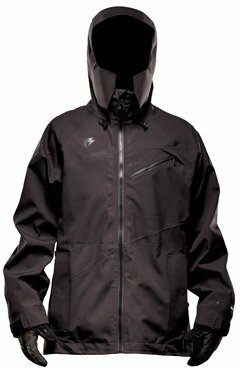 One of the coolest things about this jacket is the Darth Wind Hater which is an extension of the collar that covers the side of your cheeks below your goggles. It has the same soft material that is on a normal collar on the inside which feels pretty good. You can tuck your nose and moth under the center of the collar on the chair. When you are riding your moth and nose have an open path to air but your cheecks are blocked which is perfect. It’s like a contour plus hood. It works well with a helmet but it also works pretty well without it. When it comes to waterproofing 20k is pretty solid. When you add 3.5 layers to that it’s even better and almost right there with a 3 layer Gore-Tex Jacket. 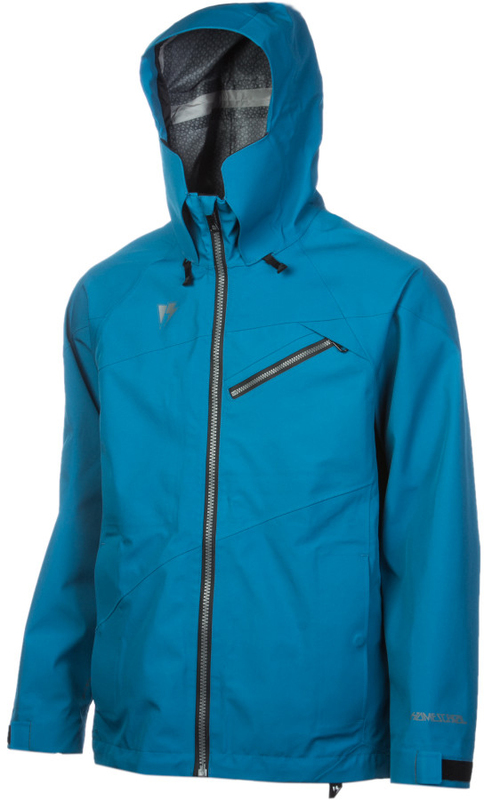 The breath-ability is pretty solid at 25k which is top notch for a non Gore-Tex jacket. 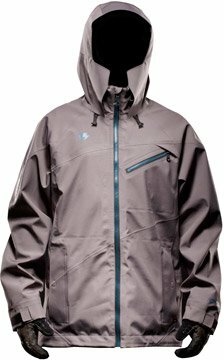 Most 3 layer non Gore-Tex jackets offer 20k which is pretty common but usually have 10k-15k of breath-ability. Their new cocona tech works and you wouldn’t expect this from such a thick jacket. There are many jackets out there these days but Homeschool has a nice take on creating a solid snowboard specific jacket that could almost be called a part of an exceptional layering system for those that see almost any kind of weather. We try to get as many images of the Homeschool Anvil, but forgive us if they're not all there.